With Central Connecticut State University opening its Football season on Sept. 1 at Syracuse University, is the team more focused on potential injuries or game prep? A study published last month in the Journal of the American Medical Association found chronic traumatic encephalopathy in 48 of 53 -- 91 percent -- of the donated brains of deceased college football players. If you play football, you’re susceptible to suffering a concussion from a blow to the head. It’s no secret that repeated trauma to the head can cause CTE. College players know this. But they still play anyway. His coach, Pete Rossomando, banned players from all social media in preparation for the season. It’s all about getting ready for game one in Syracuse on September 1. Rossomando said that he and his staff have always done what they can to avoid player injury, including following NCAA guidelines of limiting periods of player contact. The University of Connecticut, with Randy Edsall back at the helm, begins its season Aug. 31 vs. Holy Cross. After deciding to leave for Maryland in 2011, Randy Edsall returned to coach the University of Connecticut this season. He’s busy trying to restore the football program to prominence. He acknowledged that concussions are a part of the game and that players have to accept that when they play. Keith Penney, an orthopedic surgeon at Torrington’s Charlotte Hungerford Hospital, is a football team physician for five towns in northwestern Connecticut. He’s got three kids and allows them to all play the sport. He agreed with Edsall. Penney admitted that he and his colleagues were alarmed by the study but he said that results from those tests were a bit skewed because many of the brains donated came from deceased athletes who had experienced symptoms associated with CTE such as depression, substance abuse, and suicidal tendencies. According to Penney, these “second-impact” concussions are the killer. And linemen like CCSU’s Orange are the most at-risk, because unlike the smoking gun hit — say if a wide receiver is nailed in the open field — you don’t necessarily notice what’s going on to the guys in the trenches. Orange has suffered a concussion in the past, back when he was at Windham Tech. Kathy Pirog, CCSU’s head trainer said if a football player shows obvious concussive symptoms, her team begins a roughly 10-minute process of evaluation. The test focuses on things like balance, concentration, orientation, and memory. If a player fails, he goes into the NCAA’s protocol where return to play cannot happen until a player is asymptomatic. To get back on the field, the NCAA suggests an individualized approach: wait until you can get back to baseline test levels and you’re cleared by a doctor. In a perfect scenario, the player that suffers a concussion in a Saturday game proves that they are symptom free for five days and then returns to practice on Friday, without missing a game. Because signs and symptoms are not always immediately apparent when a player suffers a concussion, it’s real hard for there to be a perfect scenario. The NCAA and schools police themselves when it comes to player safety. 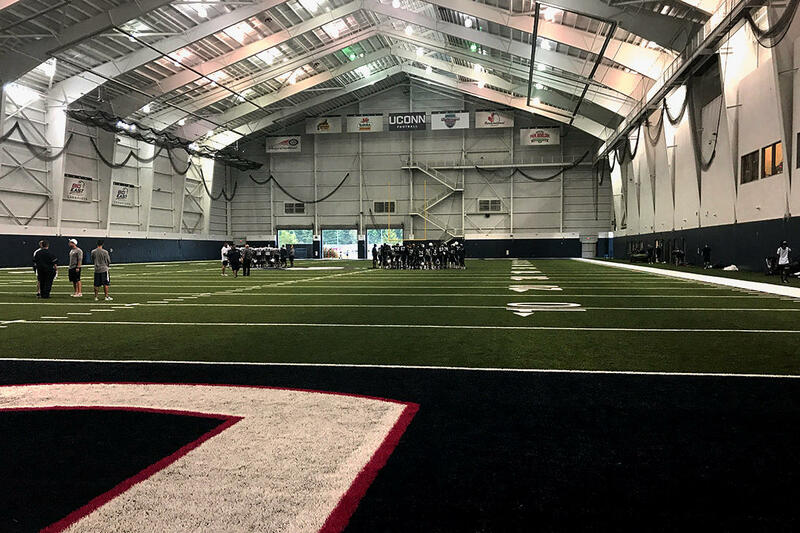 Last session, the Connecticut General Assembly considered, but failed to pass, a bill that would have established a legislative committee to enforce rules around the treatment of concussion. School budget issues may be particularly acute in 2017, but many athletic programs across Connecticut have dealt with flat funding for many years. And no district knows exactly how much money they will get from the state this year.